Meet a creative group of quilters who love antique quilts as much as you do. Let the Divas teach you how to stitch intricate 19th-century inspired quilts. 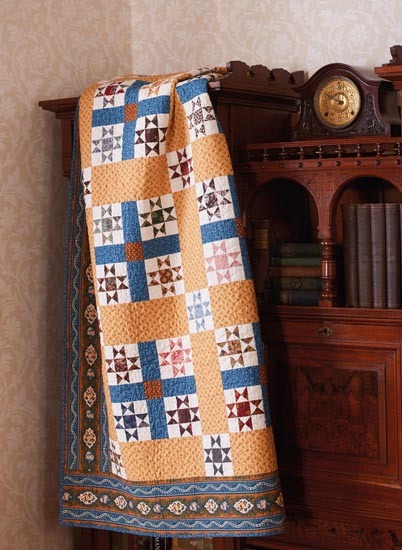 You'll love piecing the elegant quilt blocks yourself or with friends in an ongoing block exchange. 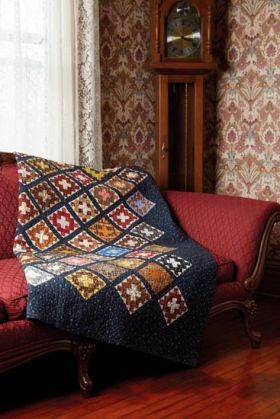 Each classic block is presented in four strikingly different quilts that will inspire hours of pleasurable stitching with your favorite reproduction fabrics. 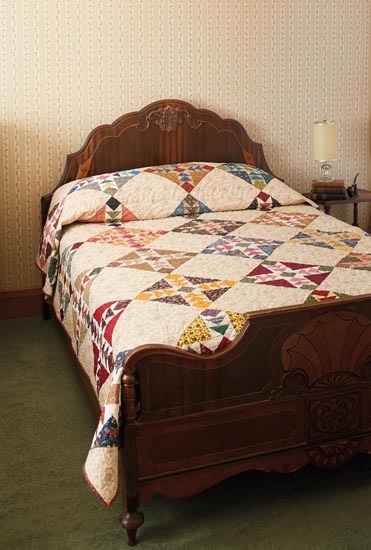 Enjoy the love of yesteryear's quilts and true friendship exquisitely stitched together! I love it when authors show more than one colorway. But this book gives another twist on the “more than one way” theme. There are 10 patterns but 30 options according to the wording on the book. When I looked through the book, I found the block and pattern and then three more ways to set the blocks to make other quilts and sometime even more than that. 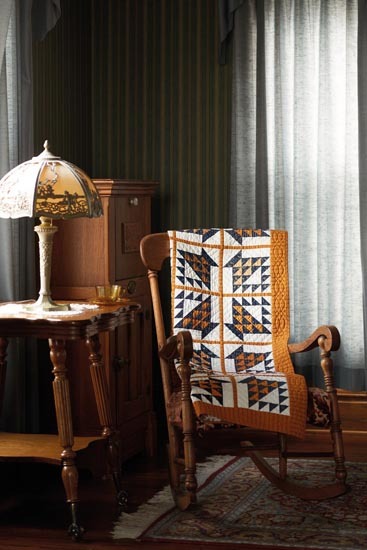 These patterns begin with a full color page about the block that is used. 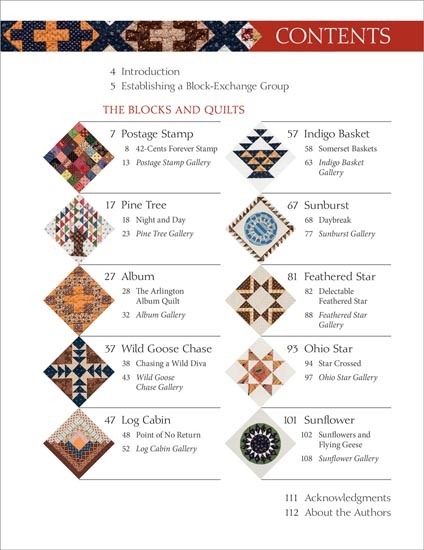 The next page shows the first quilt option along with the finished block and quilt sizes. There is a paragraph about the block. Materials and cutting lists are next and the written instructions include plenty of graphics so you can be sure you are piecing the block/quilt correctly. Then there are more full color pages, each with another way to make a quilt using the original block. Complete instructions for the other quilts are not given but there is enough written under the photos of each that you can figure out how the quilts go together. Templates, if needed, are included at full size. There is a page with bios of both authors. 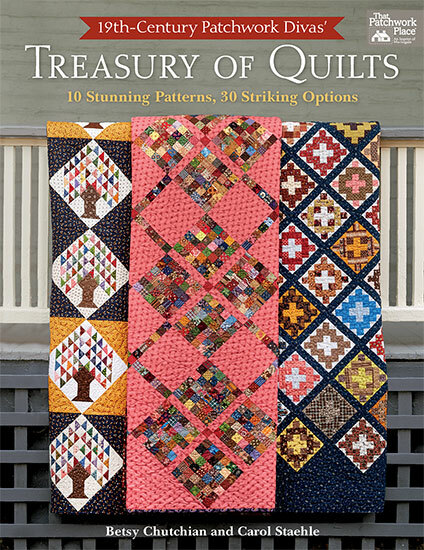 This book will give you 43 quilts, according to my count, with just 10 different blocks. If that is not enough, you can change the block around until you find another layout that you like. The point is this book gives you a great starting place and you can create more using your own ideas. I am a student of Carol Staehle. The "Patchwork Divas' Treasury of Quilts," brought to life the possibilities of beautiful block exchanges. I found the "tips" within the pattern a nice addition to the instructions. The pictures and displays were beautiful. I will never forget the classes I attended at Betsy's club!! I learned so much and these classes ignited a passion I will have a lifetime!! 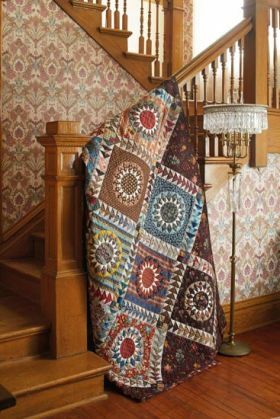 Join the Patchwork Divas quilt group as they share a selection of their block exhanges from the past 20 years. In each chapater you will find instructions to make the featured block as well as instructions to make one quilt from the block. 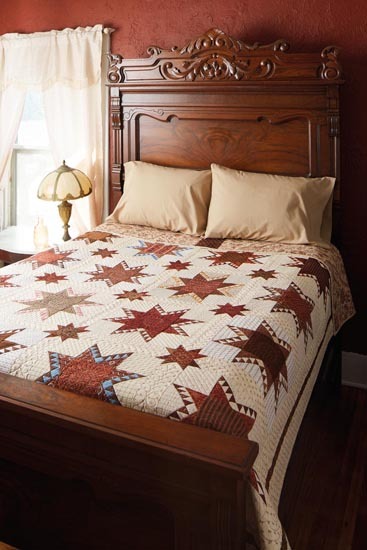 Also included are three additional quilts using different settings. There is a total of 10 blocks featured and some great tips on how to arrange your own block exchange. 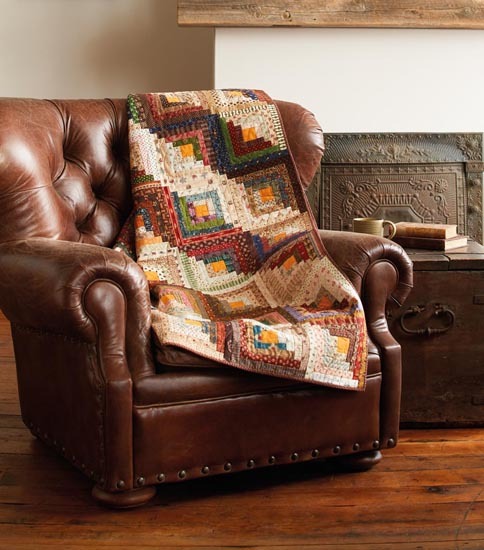 If you love antique quilts, this book is a great addition to your bookshelf. 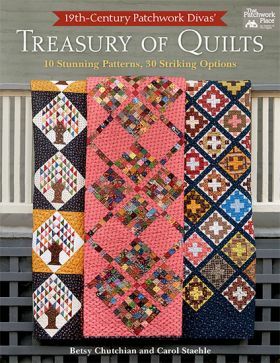 19th-Century Patchwork Divas' Treasury of Quilts: 10 Stunning Patterns, 30 Striking Options comes from the Divas quilters who show how to stitch detailed 19th-century inspired quilts, and use antique designs in contemporary patterns that create strikingly different quilt results. From full bed quilts to throws, these quilts display classic Log Cabin blocks, Basket blocks, foundation- and template-based Sunburst blocks, and more. Full-page color photos and patterns compliment an array of traditional approaches that incorporate flexibility into their patterns. Betsy Chutchian is an author, a designer for Moda Fabrics, and the cofounder of the 19th-Century Patchwork Divas. 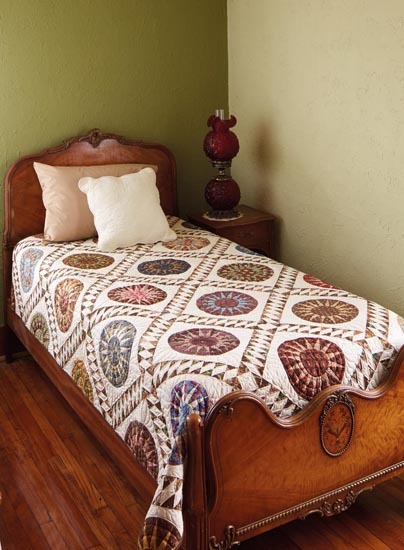 She developed a passionate interest in fabric, quilts, sewing, and history as a child. 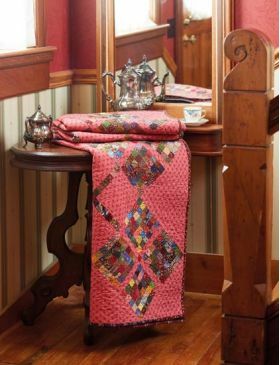 She enjoys sharing her passion for reproducing 19th-century quilts. Visit BetsysBestQuiltsandMore.blogspot.com. Carol's love of needlework began when she was a young girl with simple embroidery and cross-stitch. A sewing class at age 12 was her first adventure with a sewing machine. That interest lasted for decades until the mid 1980s when she took her first quiltmaking class. Making clothing suddenly took a backseat to making quilts, which has occupied her free time for the last 30 plus years. 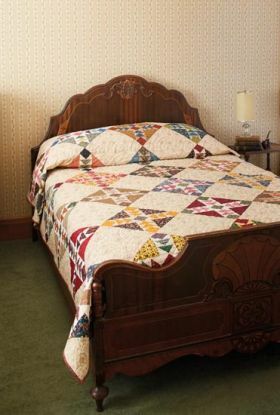 Carol feels fortunate to have a quilt from each of her grandmothers, which she will pass on to her granddaughter, who has enjoyed making her first quilt at age 8. Prior to moving to Texas in 1987, Carol had taught junior high language arts in Michigan and Iowa and high school English in Ohio. 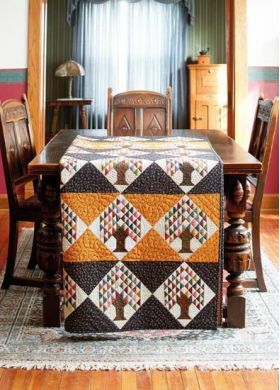 An award-winning quiltmaker, she taught the "It's Okay" class and other quiltmaking classes at the local Arlington quilt shop for many years. Currently she leads a bimonthly club at Cabbage Rose Quilting and Fabrics in Fort Worth.